Opportunities are just estimated amounts of Sales deals or in other words the best revenue you can get from a deal. SugarCRM CE allows you to fully manage opportunities related to different stages from the Sales process and in the next few lines of this tutorial we will fully explain how this should be done. For managing all the Opportunities of your organization SugarCRM CE provides you with a dedicated page. 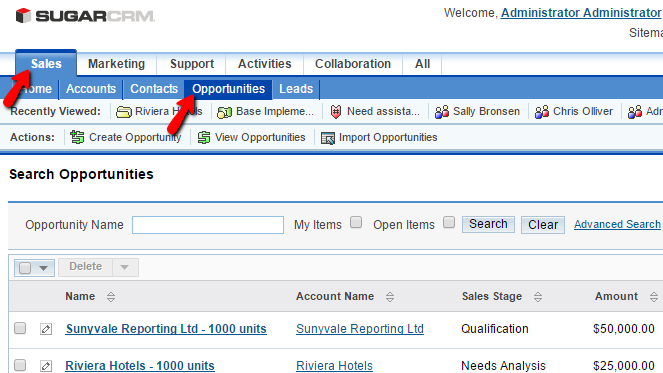 You can access that page if you login into the SugarCRM CE installation and then by navigatin to Sales > Opportunities. There you will be able to find a table view with all the currently create opportunities on your website. In order to add a new Opportunity you will need to click on the Create Opportunity link which is located in the top "Actions" bar. Type - Here you will be able to choose if the opportunity is related to an existing client or to a new one. Probability - This is determinated from the SugarCRM CE application based on the selected Sales stage. The last section of settings is called "Other" and there you will be able to assign an employee to this opportunity. In this step we will review both the Edit and the Delete activities of the Management for your Opportunities. In order to Edit an Oportunity you will need to first and foremost find the Opportunity you would like to edit. 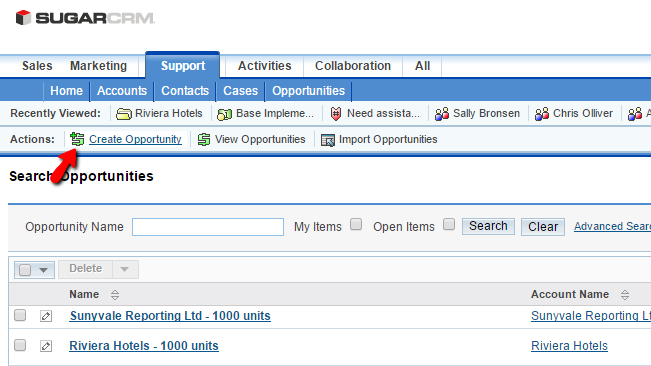 This can be achieved with the Search module which is located at the top of the Opportunities page. Once you find the Opportunity you will see a small pencil-like button which if you click you will be presented with the editing interface. This interface is the same as the one you have used for adding a new Opportunity but with the only difference that the fields there will be filled already. Once you are done with the editing please click on the "Save" button so the editing can end and your changes can be saved. In order to Delete an Opportunity you will need to find the Opportunity first. You can use the search module at the top of the page so you can find the Opportunity you need and once you do so you should mark the opportunity by clicking on the small checkbox in the beginning of the table record. Then you will need to click on the Delete button which will appear at the top of the table view and once you confirm the deletion from the pop-up notice it will bepermanently deleted. Congratulations! You now know how to fully manage the Sales Opportunities of your organization in SugarCRM CE!